The month of May is my favourite, sun warm on my back, zesty green, soft-hued Naples yellow – thermals and stinging fingers forgotten – more daylight, more opportunity . . . May is about beginnings, the promise of summer and wonderful new painting experiences around the corner. 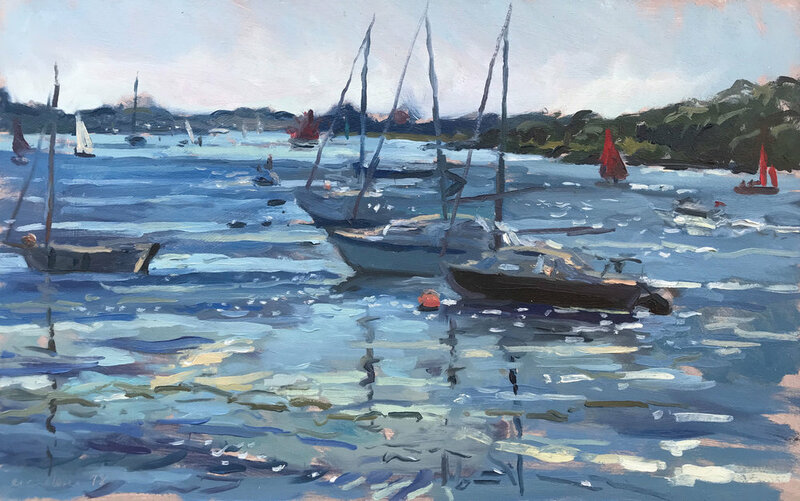 It was a May day that initially enticed me to paint outdoors, and from the first time I tried en plein air painting, I was hooked. This May, to celebrate this hugely important artistic development for me, I am putting on a solo exhibition at the Norman Plastow Gallery, in Wimbledon (click here for more information). Entitled ‘City | Country | Coast’, my exhibition will comprise 40 new works. Having moved out of Wimbledon two years ago it’s been lovely to be back with paints and easel in my beloved London, and I’m thrilled to be able to offer over a dozen paintings of London scenes for sale, including Wimbledon, Richmond, Hammersmith, and Battersea, as well as works depicting coastline and countryside further afield. 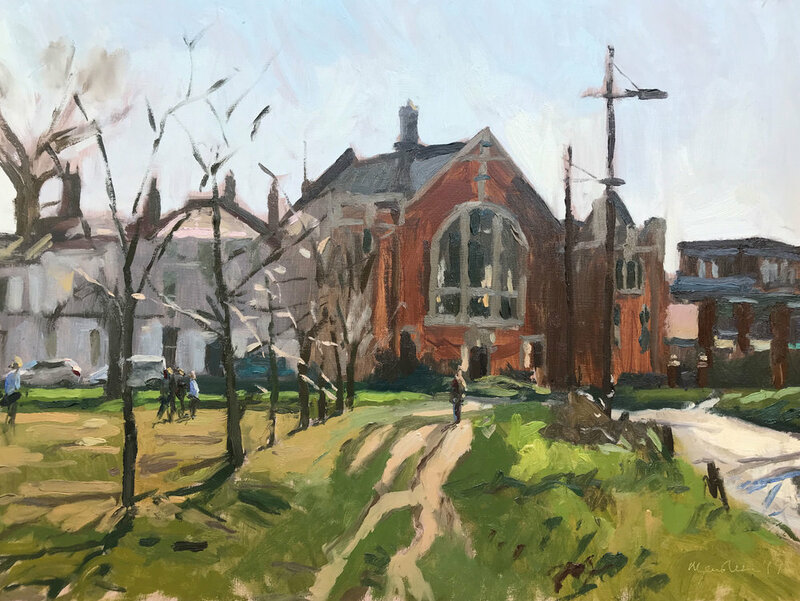 As a little preview, and to mark the countdown to the exhibition, there are a few paintings here that will feature in May, together with a selection of my memories and experiences of painting en plein air. For anyone who’s thinking about doing it for the first time but are not sure – do it anyway! I guarantee you won’t regret the experience. First bit of advice: come to my exhibition! I'll happily talk all night. In general, there are plenty of opportunities across the UK to learn. So much so that if you are having trouble working out which course suits best, go a different route: find an artist you like to see if they offer courses, or can indulge you with a one-to-one session, or give advice about a teacher they rate highly. Once you have had a bit of experience, I highly recommend you become a friend of the Royal Institute of Oil Painters, or the British Plein Air Painters, both of which hold painting days throughout the year. I have taken part in a few and I can’t recommend them enough. It’s also surreal to be standing next to a huge name in the art world who’s eating a peanut butter sandwich whilst freely imparting advice. Keep it simple for your first outing: brushes, paint, palette (keep the paints limited), a surface and easel of some kind, your preferred medium, paper kitchen towel, and a bag to take your rubbish home. One piece of advice above all else: CHECK AND DOUBLE CHECK YOU HAVE ALL YOUR EQUIPMENT. I was recently commissioned by King’s College School Wimbledon to complete a snow scene of its Great Hall and rocked up to realise I’D FORGOTTEN MY PAINTS. The UK is blessed with overcast days and fortunately cloud is the ideal type of weather to work in as a beginner. Rapidly shifting light is hard to paint, and cloud cover not only helps keep things consistent, it stretches out your painting time. I would avoid water for this reason, particularly tidal, which will give you an array of different colours each glance and bobbing boats to contend with. I completed Dell Quay, above, in August 2018. It was a cloudless sky and I arrived late in the afternoon when the sun was dropping at such a pace the light was changing by the second, and reflecting off everything! The scene was breathtaking, and colour-saturated, and it was difficult to know when to stop. Constantly squinting, my shoes soaked from the incoming tide, I was exhausted when I finished. But I absolutely love the end result and would do it again in a heartbeat. The minute you incorporate anything with wheels or feet, you’re adding significantly to the challenge of an en plein air, so a busy street scene is not the ideal place to start. Plus, you might find initially that it’s off-putting to be observed and approached by members of the public. However, once you feel ready, the thrill of working in a busy public scene is huge. It ramps up adrenalin levels considerably (which can give you all sorts of unexpected results) and offers the chance for interesting, sometimes lasting, encounters. A total rush. This is London’s Southbank: paired with a stiff riverside breeze and a bustling, inquisitive crowd, the result was a loose and dramatic composition that’s driven by the exquisite light and energy of the day, and adrenaline, as a result of people constantly approaching me. You get used to people coming over for conversation, and very quickly you will learn the trick of how to close a conversation down. However, usually my interactions with the public are funny or sweet, or interesting. I also have a little bet going with myself when members of the public tell me they have a painter in the family. Nine times out of ten their relative is a watercolourist (when I work in oil), and ALWAYS an aunt. While it is crucial to keep your subject matter varied, do return to a scene you have done before every now and again. This scene might be something you struggled with the first time you did it. Or a place and painting experience you remember with great fondness. Either way, en plein air is a never-ending learning curve, and going back to repaint something will help you measure improvements . . . as well as conquer old demons. I have a few such places, and it’s like visiting an old friend. Plus, no two days are ever the same, and I always come away with something different. Two of my favourites are Wimbledon Common, and a little spot in Surrey, along the River Wey, where the water is shallow enough for people to paddle. They bring deck chairs, and picnics, and horses sometimes stop to drink there.